Once upon a time, an unprepared public speaker who was invited to a speaking engagement before a group of 9-year-olds, bombed big time. She arrived unprepared, failed to make clear points and talked too fast. The audience fidgeted and talked and otherwise fussed, and I, who, as you may have guessed was that speaker, came away from the event feeling awful. I’d let my audience down. Many speaking engagements later, I still haven’t forgotten that fail, but I have gotten past it, even in spite of suffering from the medical condition known as glossophobia, or more commonly, public speaking jitters, complete with sweaty palms, shaky hands and nervous energy. After all, part of my job as a public relations professional is to get out there with my firm’s message and to help my clients become thought leaders who can effectively communicate with their target audiences. 1. Begin with a friendly crowd. If it’s been a long time since you have delivered a speech in front of a group or it’s simply never been your thing, start small to test your skills in a less intimidating way. Find a local library that offers seminars and suggest yourself as a source for one; approach a specialized networking group and offer to deliver a talk; or address a friendly crowd on a favorite topic, even if it’s to a group of four colleagues. If the crowd is a manageable size and you are talking about a topic that is second nature to you, the odds of having a great experience will increase for both you and your audience. From there, you can build on your confidence and the size of the audience. 2. Make prep your first step. 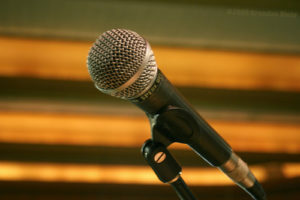 Don’t wing it when it comes to public speaking. Just because you are familiar with the talk’s subject, doesn’t mean the words are going to flow when all eyes are on you. Even if the subject is as innate as your career path, organizing your thoughts, choosing your main points and rehearsing a few times can help you gain comfort and confidence. For me, three or four rehearsals usually does the trick without making the talk sound overly scripted. When I rehearse, I stand up and do my run-throughs with visuals. I ask a trusted friend or (barely willing) family member to listen so I can get real-time feedback for improvement and make any final adjustments before the heat is on. 3. Know your audience. Seems basic, doesn’t it? You’d be surprised how many people overlook this step. A friend of mine told me a story about how she’d kicked off a commencement speech with a seemingly funny joke. As it turned out, it was inappropriate for the audience and all she heard after delivering the punch line was the sound of crickets. Ouch. Knowing your audience and what its members hope to get from you, allows you to tailor the content and connect. For instance, you would probably want to use different images and anecdotes with a group of millennial females in the tech industry than you would with a group of largely male, middle-aged accountants. 4. Talk to yourself. Getting in the right state of mind is essential before addressing a crowd because it can help alleviate the jitters. While each person has to find his or her own best approach, for me it involves playing pump-up music on the way to my venue, similar, I’ve heard, to what many athletes play before a big competition. After that, before heading into the room, I take deep breaths to relax my body and then, just before taking the mic and grabbing my clicker, I repeat a positive phrase or mantra. Sometimes it’s as simple as, “You’ve done this before, you can do it again,” but it really does work wonders in calming my mind and easing my anxiety. 5. Do you. Trying to emulate a public speaker you admire, is a sure way to fall short, especially if the person is a professional orator who may have a speechwriter, coach or teleprompter to lean on. While you may adore watching Gary Vee or Michelle Obama in action, the best way to shine is to be your authentic self. If you slip, make a correction with a simple, “What I meant to say was…” and move on. Or click back to the slide before and say, “I got ahead of myself. 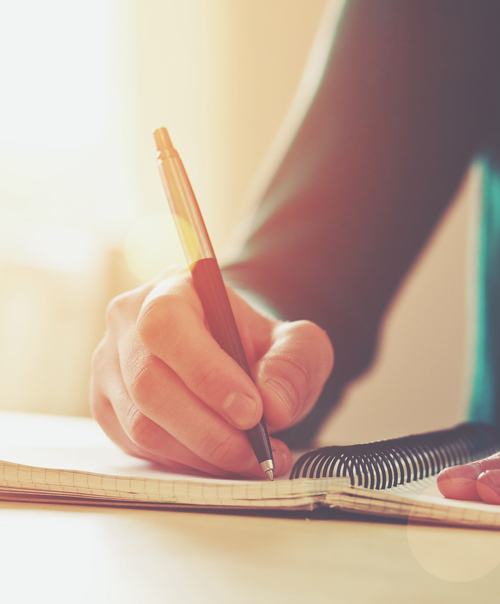 I also want to share with you …” I like to have cue cards or a printed version of my notes with key points highlighted on hand to ensure that I stay on track. I don’t stare at them, but having them handy makes me feel more secure than if I pressured myself to do without them. 7. Expect the unexpected. Undoubtedly, not everything will go exactly as planned, so be ready to roll with the unexpected. Audio-visual equipment might need on-the-spot attention, there may be fewer attendees (or more) than you’d expected, someone might ask an unanticipated question or the person who spoke before you might have gone over-time, cutting into your presentation time, all of which have happened to me. While there isn’t much point in worrying in advance, it does help to arrive early to get the lay of the land and test equipment. I recommend asking your organizer what the room layout will look like, who will be in the audience, who will introduce you and what items you need to bring yourself. From there, be ready to pivot if something doesn’t go your way. 8. Make it all about the audience. When delivering a speech, it’s imperative that you connect with your audience rather than simply wow them with fancy graphics and info-loaded charts. Make eye contact and vary where you place it every now and again. If you are talking before a large crowd, imagine a figure eight and start in the back right-hand corner of the room, slowly and subtly tracing where you look to make your way around the room during the talk. Speak slowly so the listener can catch what you’re saying. Remember to pause here and there, as you would in a natural conversation, especially if your audience reacts with a laugh or surprise. Giving the crowd a moment to process what’s being said and their emotions makes your speech better. Another important consideration is to deliver on your promise to the audience. If you are there to talk about widgets, by golly, make sure all of your main points and the powerful final conclusion relate to widgets. Last, but not least, even though you might be the person at the front of the room, remember that a speaking engagement is a two-way conversation – ask questions, encourage interaction and let the audience in. 9. Keep at it. The only way to get better at public speaking is to speak more often. Find places to keep your skills fresh, whether it’s at a Toastmasters event, your local Chamber of Commerce’s get-together session, a networking group or even in small groups on the job. 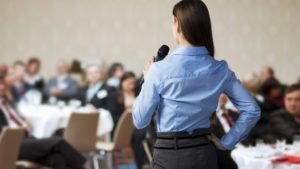 Every time you have a successful speaking experience, you’ll build confidence and add a positive memory to the memory bank to withdraw and focus on when the next opportunity presents itself. Whether your audience is 9 or 99 years old, or includes 9 or 99 members, here’s to standing and delivering with confidence. This article originally appeared on CommPRObiz. ©2018 Impact PR & Communications, Ltd.